The Natural Products West Trade Show held on March 8-12, 2012 at the Anaheim Convention Center hosted over 3,000 exhibits showcasing new products including Helps Organic Teas. This convention is the leading trade show in the natural, organic and healthy products industry. They had an estimated 58,000 industry professionals in attendance this year. HELPS Teas comes from Pharmadus, a global parent company that is a leader in health and wellness for over 50 years. Pharmadus brands including HELPS Teas; Manasul, a well-known tea staple in Hispanic communities; HELPS Intense, high quality pyramidal teas; and Lateterazul, a line of gourmet teas featured a well-designed exhibit booth that was a smashing success with tea aficionados and fellow attendees. From this success, HELPS Teas will be exhibiting at Expo East Trade Show this year. 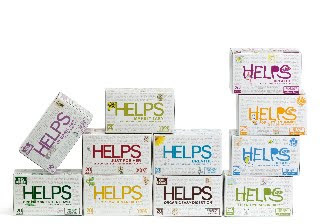 HELPS Teas products are Kosher certified and have zero artificial flavoring and no preservatives. They have two product lines, HELPS Kids and HELPS Wellness. HELPS Kids are safe for children 2 and up and are designed to help little ones feel better. Help your little one fall asleep with DREAMS; offer relief for an upset stomach with LITTLE TUMMIES, help clear their throat with BREATHE; and feel refreshed with FOR REHYDRATION DIETS. The HELPS Wellness adult line consists of ORGANIC R&R, a combination of lemon balm and passion flower that has a soothing effect ending restless nights; BREATHE, supports respiratory and sinus functions; ORGANIC GREEN TEA LEAVES, promotes overall well-being and added bonuses include beautiful skin and anti-aging ingredients; FOR LOW SUGAR DIETS, the sugar free answer for diabetic cravings; MAKE IT EASY, does exactly as it says by regulating your bowel movements; last but not least, JUST FOR HER caters to women with menopause. My favorite HELPS teas are the Organic Green Tea and Organic Rest and Relax. Both are refreshing and flavorful. HELPS Organic Green Tea Leaves combines naturally dried organic green tea leaves and spearmint. The antioxidant properties in green tea helps you feel better inside and out because it neutralizes the effects of free radicals. HELPS Organic Rest and Relax combines lemon balm and passion flower which helps you relax and rest easier. 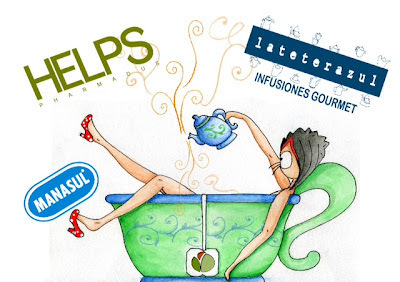 For more information on HELPS Teas you can visit them online at helpsteas.com or visit them on Twitter and Facebook. *Disclosure: I received a box of HELPS Organic Green Tea and Organic Rest and Relax in exchange for this review. All opinions are accurate and 100% mine.